I now want to briefly talk about the region just below the pyramid in the overworld portion of the artifact. Notice how it's divided into eight sections? Since eight is simply four times two, I can't help but feel that this has something to do with the winds, parallel to the Greek winds (Boreas, Zephyrus, Eurus & Notus). Yet if this parallel is valid, why eight instead of four? Let's look at how these sections are marked. They read from left to right, top to bottom: caθa, tins θneθ, fuflus, θuflthas, lasl, tins θuf, leθm and tul. The first thing that I notice in this grouping is that they can easily be divided into four male deities (tins θneθ, fuflus, tins θuf, tul) and four female deities (caθa, θuflthas, lasl, leθm). 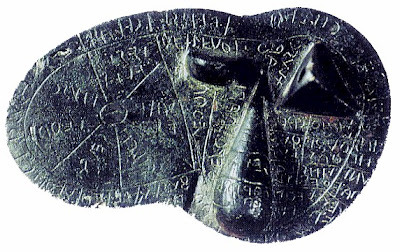 Though the artifact uses abbreviations, we may surmise as to who these deities are thanks to a parallelism with Roman mythology and a working knowledge of the Etruscan language. The male deities are thus: Tin Thneth (Thundering Tin), Fuflun (Bacchus), Tin Thufl (Tin of Oath) and Tul (Boundary). The female deities are thus: Caθa (Abundance), Thufltha (She of Oath), Lasa (Nymph) and Letham (Streams). Tin Thneth and Tin Thufl are two incarnations of Tin (the daytime sun) and clearly parallel to Roman Jupiter Tonans and Jupiter Fidius respectively. Given the arrangement of these deities in the tiny grid and the apparent functions of these deities, we might seperate them into four celestial pairs, no doubt then representing the four cardinal directions or winds: Fuflun & Catha (north); Tin Thneth & Thufltha (south); Tul & Letham (west); and Tin Thufl & Lasa (east). For added interest, we may note that Catha and Fuflun are already known to form a religious pair since TLE 131 (Laris Pulena's sarcophagus) appears to indicate funerary devotion enacted specifically in the name of these two earthly deities. After commenter Hans told me that my Sínat game wasn't playing up to par with him, I decided to see whether I could code a better strategy into the game. I figured it shouldn't be hard to make an improvement. Afterall, the only thing the computer is programmed to do is to find a list of available moves and then pick a move randomly from that list. How could any strategy be worse than that? A few days ago, I coded a new strategy on my computer to test out. Basically I told my program to evaluate each move and favour those moves which yielded greater protection of one's own pieces at the greatest expense of its opponent's protection. Seems right, yes? Apparently not. After I played the game, I still came out on top without much fuss and that got me a little curious. So I decided that I would seperate my random algorithm from this new algorithm and have them battle it out. I called the "random" strategy Lateesha, for kicks, while I baptized the other "protection" strategy Shanequa. With Lateesha in red and Shanequa in blue I unleashed the two algorithms against each other for 20 turns to see what the statistical outcome would be. The results were surprising. Our ol' lady of the block Lateesha won 55% of the time (11 out of 20 moves) over the new kid Shanequa!! What?? Yes, apparently randomness is better than being protective! It appears that this game does not reward overcautiousness because by being too focussed on one's own protection, one's pieces will be slower to get to the end of the board while one's opponent's pieces may pass one by. As a result, I've so far changed nothing in the A.I. programming. Now I have to think up a better strategy. Back to the drawing board. This diagram from page 100 of The horse, the wheel, and language (2007) by David W. Anthony gives a detailed solution to the exact chronology of Proto-Indo-European (PIE) and its later daughter languages. I quite like this timeline which places Proto-Indo-European within a range of 4500 BCE and 2500 BCE. The author suggests that Anatolian split away from PIE specifically around 4200 BCE. For kicks, I might be tempted to overlap it with my own chronology of Pre-IE to create a detailed overview of Indo-European diachrony. I'm perfectly fine with cutting off a couple of centuries from my "Late IE" period like this. 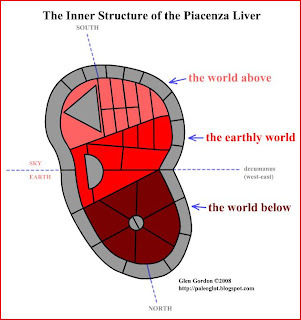 Of course, as we all learn more details concerning this fascinating subject, our picture will be prone to modifications but for what it's worth this represents my understanding of PIE's timeline at present. Just a quick heads-up about a revisal of my Sínat game. After one commenter, Hans, rightly noted that the probability distribution of numbers thrown by the four ancient Egyptian casting sticks were not the same as the even distribution of a die, I went to work readapting the game to reflect this. My game now allows multiple moves whenever 1, 4 or 5 is thrown. This better reflects Kendall's original rules which are apparently inspired in part by a similar modern Arabic game called Tâb. I honestly had never conceived that there would be a difference between sticks and dice. I just blindly assumed that numbers should show up with equal frequency which made the extra turns on 1, 4 and 5 too obscure a rule for me to include but all that's changed. For those interested in the programmatical solution to this, it's merely a matter of telling the computer to find a random number from 0 to 15 which in binary is represented as the numbers from 0000 to 1111. By conceiving of the four sticks as a single binary number of four bits, we can then isolate any particular bit with boolean bitwise operators and add up the total of 1's. We also have to remember to convert 0000 to "5" since this represents the four sticks facing down. I have to admit to my shame that I'm probably more infatuated with my own Sinat game than my readers. I just love puzzles, especially when they have a long history behind them, and it's fun to make things for yourself. I'm a tinkerer afterall; that's my nature. At any rate, one thing I learned while programming this Ancient Egyptian game this month was the funerary connotations associated with it. Sinat literally means "passing" but this can mean various things. It can be interpreted as the game of passing pawns, of course, but passing is often also a euphemism for death in many cultures. That is, the passing of the deceased to the afterlife. 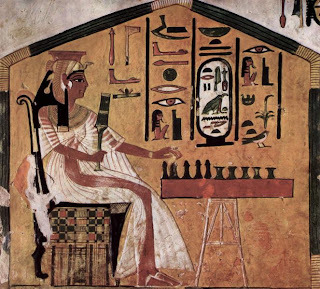 In the above picture, we can see the literal image of Queen Nefertari playing Sinat but what lurks underneath this tomb mural is the metaphor and wordplay of a deceased woman casually "passing" to her afterlife. The picture of this game here is in a manner of speaking a meaningful hieroglyph in its own right signifying the queen's posthumous journey. There's also the matter of the winding boustrophedon path of the pawns along the three rows of the board (at least, according to Timothy Kendall's rules). This winding path is yet again an otherworldly symbolism and is related to the reason why ancient inscriptions in Etruria and in the Aegean area were sometimes written in a boustrophedon or spiral pattern. This magical pattern is, oddly enough, an abstract representation of the "bowels of the earth" and a reference to both the divinatory practice of extispicy and an ancient conception of the journey of the sun under the horizon during the course of the night. As you can see then, a game with such a long history behind it is sometimes more than just a game. Ancient religious murals aren't what they seem either. Similarly in the modernday, we often use chess as a metaphor of a battle of wits, although I have yet to hear someone say that someone was "checkmated" as a circumlocution for "dead". For example, Latin obīre (mortem) "to pass through (death)". I've also suggested on my blog in Paleoglot: Death and euphemisms in Etruria that Etruscan lupu is in reality not literally "dead" but "passed on". Pinch, Egyptian Mythology (2004), p.127: "In enigmatic scenes in New Kingdom royal tombs, the nocturnal sun has to pass through the body of the crocodile Penwenti, who symbolizes the primeval waters, in order to be reborn. Greek and Roman writers recorded a bizarre Egyptian belief that ichneumons (a type of mongoose) killed crocodiles by running down their throats and gnawing their way out through the bowels. This may be a misunderstanding of the mythical conflict between the sun god Ra in the form of an ichneumon and Apophis in the form of a crocodile or a snake." (see link). I mentioned very briefly in my last post that my experience with Aegeanet, a forum devoted to the topic of the Aegean Bronze Age, so far is not all that it's cracked up to be. In all fairness, the problems that I observe on Aegeanet are sadly no different than what I've noticed on other forums of this nature in more than a decade that I've participated in them. I hardly hide the fact that I'm a strict logician in scholarly matters. That is, if one must be faithful to something at all, I believe it should be Logic. Afterall, I've never seen an airplane built on Christianity, I've never seen a math problem solved with Islam, and when you're falling from 300 ft from the ground, Buddhism is never going to help you avoid the inevitable, although it may give you a calm state of mind before the boneshattering impact. While Aegeanet claims to disallow ad hominem attacks, it appears that this is untrue. Even when a message clearly has no academic value and makes the character of another member the topic, it's let through, as was the case with a message from Doctor Jack Dempsey who later went on to annoy me with private messages of vitriol. However, when it comes to these email forums, this is only typical and I don't lose sleep over it since unsubscription is just a click away. The effective moderation of online forums is dependent on a healthy ability to recognize Logic from pointless nonsense. Without a rational and active moderator, most email forums are doomed to fail and what's worse, all its members' emailboxes are at the mercy of the moderator's maturity to recognize trollish lunacy from honest opinions. This is quite different from blogs where there is no membership and full helm-control is given to the contributor rather than the observer. Also the immediacy of email encourages short quips over more mindful input. Yet despite these advantages of blogs over email forums, bloggers too may be as irrational as they wish, even if it is a negative advertisement. What always concerns me though is a much larger phenomenon that I feel this trolling and inability to debate is a symptom of: societal acceptance of irrationality as a valid philosophy. This is perhaps a particularly timely topic after a killer of a young Winnipeg man innocently enjoying a ride on a Greyhound bus was considered "not criminally responsible" for beheading his victim in plain view of all the other passengers simply because he was schizophrenic. As a result, despite the utterly disgusting homocide, he will not be given a record. To any rational person, it should be entirely irrelevant whether a murderer is insane or not, since any act of murder unmotivated by real self-defense (as opposed to imagined and delusional self-defense) is so clearly irrational. The real matter at hand should be the safety of the public. Hiding his criminal record from public perusal or allowing him to ever be set free again is quite obviously opposite to public safety. Yet bureaucracy always takes precedence over common sense in our crazy world and most citizens, convinced of their powerlessness, succumb to apathy rather than outspokenness and action, drawing increasingly within their own world of ignorance. This page entitled You Fail Logic Forever lists many logical fallacies that we're bombarded with in media and society on a daily basis. It also references one of the biggest and most popular offenders of logic, Stephen Colbert of the hit TV show The Colbert Report. Of course, Steven Colbert exploits logic for a clear purpose: comedy. Good comedy afterall is nothing more than the provocation of a laugh from the audience by stating one clever absurdity after another. Steven Colbert happens to be particularly skilled at it. For those of us that are not cognitively impaired, we might take it for granted that we are fully able to discern the logic of a person's statements in matters of seriousness on the one hand as well as appreciate logical absurdities in matters of comedy on the other. Yet what if, for a growing portion of the public, the line between seriousness and comedy and between logic and the lack thereof is becoming difficult to distinguish? Now personally, I don't believe that this next generation is particularly different from previous generations just because of the presence of the new internet. I simply suggest that as civilization "progresses" and its associated bureaucracy becomes larger, so too does individual alienation, weaker attention span, and thoughtless conceit as a coping mechanism against society's encroachment on the individual. A strong grounding in the real-world and Logic is the one true means of reconnecting with the universe in which we live and overcoming this growing alienation and postmodern narcissism.